This disc is a lot of fun and aimed more at the older child/teen market. 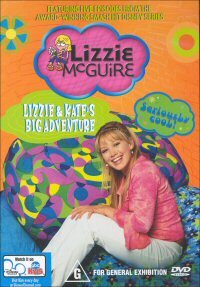 Lizzie is a kid growing up, going to school and getting into all sorts of adventures even though the star, Hilary Duff looks a ton older than she probably should for this series. There are five episodes on the disc, making up for a running time of 132 minutes, all of which are entertaining, even for the adult audiences out there who might sit to watch this with the kids. The content is more in line with the problems faced by high school students, albeit with a very funny twist that you can't help being endeared to. The quality of the DVD is consistent with what you'd expect from a television release with a nice clear picture in the 4:3 format, but the nice thing is that the audio is in a Dolby Digital Stereo Mix which sounds great. I'd certainly recommend this disc. It's light viewing that never really gets that heavy or intense, and is filled with characters that the whole family could enjoy on the TV when there is nothing else on to watch. Lizzie finds out that Larry Tudgeman, the school geek, has a crush on her. Going on a date with him would be a social disaster, not to mention gross. After a talk with her mom, Lizzie decides to give the guy a break, and finds out that there is more to Larry than meets the eye, although he is still not the guy for her. Meanwhile, Sam, Matt and Gordo try to refurbish Sam�s old downhill racer. A documentary director selects Lizzie's school as the location for his latest project - and assigns Gordo the coveted job of being the documentary's primary focus. Lizzie and Miranda are unhappy about, even jealous of Gordo's spotlight. Meanwhile, Matt falls for a girl, Melina, who also loves trouble. When Lizzie's grandmother sends her a board game, DWARFLORD, Gordo becomes obsessed with mastering it. When it gets to the point that he flunks a test at school, Miranda and Lizzie intervene. Meanwhile, both Lizzie's dad and Miranda's dad become caught up in Matt's school project. Gordo marks his transition into manhood with a Bar Mitzvah, but first contemplates other alternatives to mark the occasion. Jo goes on strike until Sam kicks in with his fair share of parenting when it comes to Matt. When Lizzie and Kate are absent on the same day, they are assigned as partners for a social studies project. Much to the dissatisfaction of their friends, Kate and Lizzie actually enjoy working together, reminiscing about days of the past when they were great friends. Meanwhile, Matt convinces people, among them Sam, that he is psychic, while Jo sets out to verify the truth.